#1 NEW YORK TIMES BESTSELLER • Includes two new essays! For readers of Nora Ephron, Tina Fey, and David Sedaris, this hilarious, wise, and fiercely candid collection of personal essays establishes Lena Dunham—the acclaimed creator, producer, and star of HBO’s Girls—as one of the most original young talents writing today. 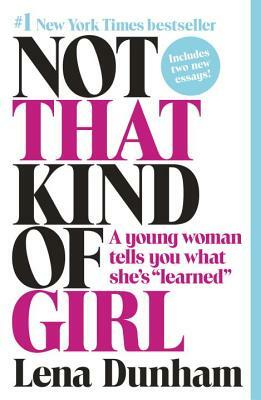 In Not That Kind of Girl, Dunham illuminates the experiences that are part of making one’s way in the world: falling in love, feeling alone, being ten pounds overweight despite eating only health food, having to prove yourself in a room full of men twice your age, finding true love, and most of all, having the guts to believe that your story is one that deserves to be told. Lena Dunham is the creator of the critically acclaimed HBO series Girls, for which she also serves as executive producer, writer, and director. She has been nominated for eight Emmy awards and has won two Golden Globes, including Best Actress, for her work on Girls. She was the first woman to win the Directors Guild of America award for directorial achievement in comedy. Dunham has also written and directed two feature-length films (including Tiny Furniture in 2010) and is a frequent contributor to The New Yorker. She lives and works in Brooklyn, New York. Joana Avillez is an illustrator and the author of Life Dressing, a tale of two women who live to dress and dress to live. Her artwork has been featured in The New York Times, New York, and The Wall Street Journal.